"Our inn’s baths boast panoramic views and 100% naturally heated hot spring water"
100% of the hot water from our scenic large bathhouse, outside bath, kodai cypress wood bath, and our various other baths, is from our own "Taikan Hot Spring," without any external heat source or added water. Please come and enjoy this gentle water, famed for its beautifying effects on the skin. "Come and spend quality time at this Japanese-style lakeside resort"
"All rooms have a lake view." We have many different baths that express the charms of Japan, such as the "Nambu Magariya Bath," where you can gaze out on the four seasons of the beautiful lake and Mt. Iwate while bathing in the waters of our own hot spring, and the large "Solitary Hot Spring," with its outdoor bath, where you can enjoy the changes of the four seasons seen on Mt. Iwate in the background. "Taking a bath tour is a great experience! An inn where you can sample 18 different baths to your heart’s content"
The "Jōmon Garden Outdoor Bath" is the pride of our hotel. We offer various accommodation plans to meet your needs. "An inn built in the style of a traditional teahouse that strives to bring together the people important in your life"
An inn built at Tsunagi Hot Spring, built in the style of a purely Japanese teahouse. We are esteemed for our warm hospitality and our warm kaiseki cuisine, the menu for which changes monthly. You can relax and enjoy dinner in the comfort of your own room. "Love the journey; fall in love with your inn"
The flooring of our traditional Japanese-style, from the hallways to the stairs, is entirely tatami. Many of our dishes, brimming with the vibrant seasonal flavors of mountain and sea, are made by the inn’s owner. Please spend some time in our "Tabisome no yu" ("traveler’s hot spring"), relax your mind and body, and let the spirit of travel seep into your very core. "An inn that takes pride in its scenic views of Mt. 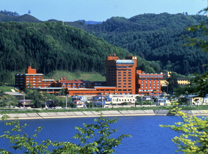 Iwate and Gosho Lake, and in its bountiful natural hot spring." Our inn has 11 traditional Japanese-style rooms on its second floor, whose wood construction evokes the atmosphere of hot spring inns from long ago. Our inn has two different wellsprings, "Kannon no yu" and "Shidanai no yu," and we pipe the water from each into the various baths in our two indoor bathing areas and our large outdoor bath. We have three detached guesthouses, each different in design, but all built in the style of traditional Japanese teahouses. Each guesthouse has its own private bath, and each bath is constructed to match the mood and atmosphere of the house. The water for the private baths is also from the natural hot spring. Our "mountain village cuisine" uses local ingredients and is largely based around the preparation of freshwater fish. We prepare everything by hand, with the utmost care. ※In-room meals are only served for guests in the detached guesthouses. A tranquil inn, situated in the highlands of the deepest interior of the Tsunagi Hot Spring area, with beautiful natural environs and scenery. Our inn, which is for tourism, business, and hot spring rest cures, and which is aimed to accommodate middle-aged and elderly people, is run based on our three pillars of rest, recreation, and recuperation. Our baths are filled with 100% natural hot spring water, which shows that our inn is ideal for hot spring cures. Our little white inn, on the banks of a creek that flows into Gosho Lake, offers you good value and a friendly atmosphere. We welcome guests here on longer stays for work, and businessmen traveling alone. Please come and relax after work in our hot spring. Our small hot spring inn in the middle of the Tsunagi Hot Spring area, is well-loved for its natural hot spring baths and dinner served in guests’ rooms. Please come and relax at our warm inn, where a feeling of clean freshness abounds. A simple, unaffected inn that will bring to your mouth the words, "Hello, my friend, long time no see!" Our homemade cuisine, prepared with love, carries with it the warmth of family hospitality. "A public inn with a convenient price "
A public inn that takes pride in its cuisine. With its convenient price, everyone can relax here, from the elderly to people traveling on business. We are also equipped with a conference room and a banquet hall, so groups are welcome. 「"An inn where you can thoroughly enjoy natural hot spring baths, and where every room has a view of Lake Gosho"
Come and recuperate at our inn, where you will feel completely at home. Enjoy the comfort of spending your time barefoot on soft carpet. Our day bath has also long been popular. Enjoy lunch in our dining hall. The entire inn is non-smoking, so please only smoke in the dedicated smoking area. Also please note that guests lay out their bedding at night. This is a lodging/training facility geared towards people engaging in sports activities, located in the Tsunagi Hot Spring region, Morioka’s inner sanctuary. Because there are various sports facilities nearby, we recommend our center as a place to stay for those engaged in strength training camps, away games, tournaments, etc. 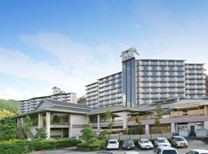 With our facility’s quality guest rooms, high occupancy training room, and medicinal baths, you can wash away your fatigue from a hard day’s training with the healing waters of Tsunagi Hot Spring.